Chad Arnold, CEO of Door to Door Organics. Photo Credit: Door to Door Organics. It’s 5 pm on Thursday, milk is running low, and the kids polished off the last of the peanut butter the night before. Working parents everywhere, stuck in traffic, are scrounging for a healthy dinner. Enter Door to Door Organics, an online organic grocery retailer that delivers fresh, organic groceries at a competitive cost with traditional brick-and-mortar grocers. The company, which was founded by David Gersenson in 2004 in his 300 square-foot Boulder, Colorado garage, now serves 9 states, operating out of five centralized hubs in Colorado, Michigan, Illinois, Pennsylvania and Missouri. Unlike a CSA, in which subscribers are stuck with whatever a single farm produces, Door to Door Organics customers are able to swap out their selections, add on an array of groceries to the order, and skip an order at anytime. The company also offers a full assemblage of groceries, including dairy products, meat and fish, baked goods, grains, pastas, nut butters, preserves, condiments, oils and vinegars, and coffees and teas. Groceries are sourced from organic farmers and food producers, emphasizing as many local products as possible. The company, which employs over 200 people and has posted a profit for the past six years with steady growth, recently received an investment from Greenmont Capital of more than $2 million, according to Daily. As a certified B-Corp, Door to Door Organics must maintain rigorous standards of social and environmental performance, accountability, and transparency. The company was the first grocery retailer in Colorado to take a “10% Local Food Shift Pledge,” committing to source at least 10% of inventory from local farmers and producers. Door to Door regularly exceeds that goal, averaging about 15% local sourcing in the Colorado market. 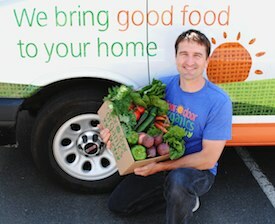 To support local farmers, a Local Farm Box – a box filled with only locally grown organic produce – is offered. Door to Door Organics also offers several community-building programs. Groups of 4 or more can form a community co-op, having their orders delivered to a single location with a $3 discount per order. The discount can be enjoyed by co-op members or donated to a charity of their choice- often a school or a community nonprofit. Over the last 3 years, Door to Door donated over $31,000 to community groups through this program. Door to Door Organics’ website interface is designed for an easy shopping experience, recommending recipes customized to a customer’s order and preferences. Ingredients, allergens and meal type can be used as filters to select recipes from a database. A proprietary ‘Shop By Recipe®’ feature allows customers to add ingredients needed to make a recipe. The company’s most loyal customers are highly educated women, moms in particular, who appreciate Door to Door Organics’ emphasis on health, convenience and support of local producers, according to Daily. Door to Door Organics plan is to continue growth and expansion, both by increasing density in existing markets and expanding into new ones, says Daily, noting that Forrester Research projects over $15 billion in online food sales in 2013. Door to Door Organics is intent on capturing as much of that market as possible, converting offline grocery budgets to online. “The greatest challenge is building a customer experience that adds significant value above and beyond the existing brick and mortar grocery store,” says CEO Chad Arnold. Providing that value entails managing complex fulfillment logistics, building a digital “storefront” that gets smarter each time a customer uses it, and creating a set of services that help people achieve health goals.